Keen to get crafty with the kids over Easter but can't embrace the mess? Or are you sick of the slime making always happening at home? Hobbycraft is coming to the rescue of parents everywhere with a packed programme of make-and-do events at its Ashford, Maidstone, Thanet, Tunbridge Wells and Crayford stores during the school break. Info: Decorate an Easter bonnet using a variety of Easter themed decorations. Note: This workshop is suitable for ages 5 and over. Children under 16 years must be supervised. Info: Paint a ceramic money box. Choose either a unicorn egg or an egg shaped money box. Note: This workshop is suitable for ages 5 and over. Info: Join our colleagues in your local store to decorate a chocolate Easter egg. On the day, you will get your own chocolate egg to decorate with different colour icing and embellishments that you can wrap up and give to someone special this Easter. Note: This workshop is suitable for ages 5 and over. All children under 16 years must be supervised by an adult at all times. Info: Let the kids get creative with our Kids' Craft Club colour-in eggs workshop. Note: This workshop is suitable for ages 4 and over. All children under 16 years must be supervised by an adult at all times. Info: Hobbycraft staff will be showing youngsters how to make textured slime. On the day, you'll be making your own batch of slime - choosing from a range of colours and textures! You will then be able to take this home in a bright coloured fillable egg of your choice! *Workshops are taking place in stores across Kent. To learn more or to make a booking for one of the activities on offer please click here. 'Tours by Brewers' Brewery Tours and Guided Beer tasting. 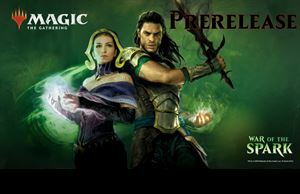 Gathering card game, Pre-Release events are a great place to begin your journey. A Kent young farrmers' club is holding it's popular lambing event this weekend and tickets start at just £1! A £400,000 new playground at a Kent shopping centre will open to children and their families next month. Families worried that their child may not be protected against measles, mumps and rubella can attend catch-up clinics running in Kent next month.